Being an artist has many privileges. One that I’ve been considering recently is that all my hard work directly benefits me, as an artist. I’m not referring to cash, or indeed caché; instead I am appreciating the quiet satisfaction of gaining more mastery. This painting by Constable caught my eye today. 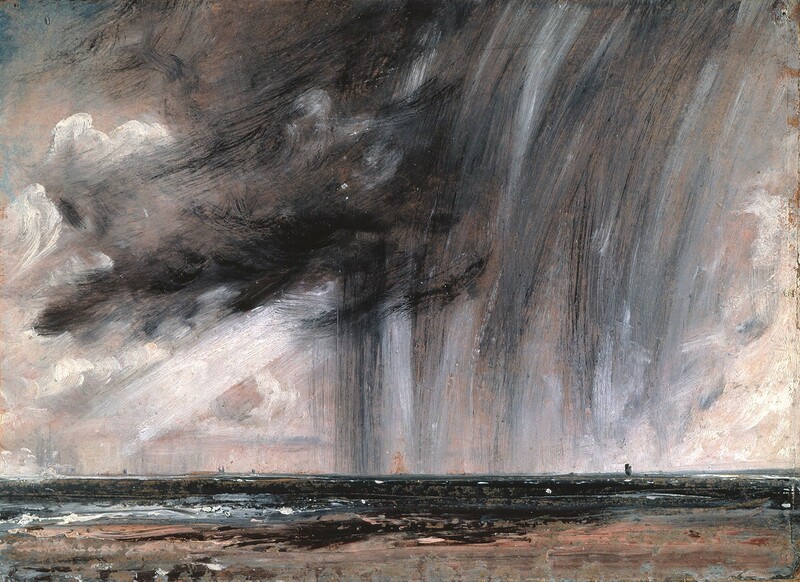 Constable painted mainly what look to the modern eye as rather fussy, although masterful, landscapes, and yet he had evidently expressive passion, as shown in this sketch. We see only the presented works of artists, the final, considered and reconsidered pieces; and yet they truly are the tip of a vast iceberg representing a life lived within art. This year, as every other year, I am recommitting to refining my practices. Currently, I have a studio emptied of works as they are on exhibit, and I am taking the chance to breathe (metaphorically, as I usually manage the physical aspect pretty well — women are multi-taskers after all). I am starting this blog with the intention of chronicling those things that strike me enough to be recorded.